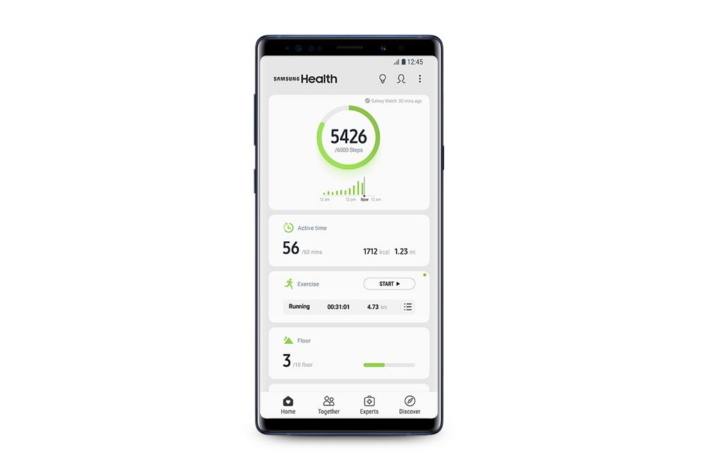 According to the developers, thanks to the improved interface, clear design and updated functionality app Samsung Health 6.0 has become more intuitive, interactive and easy to manage. Based on user feedback and latest trends in design, the developers made the home screen of the Samsung Health more convenient by grouping the functions by category to make it easier for users to find them. Now using the updated tab "Vmeste" (Together) users will be able to share photos and share your sporting achievements with friends, and participate in the monthly contest Global Challenge. The Tab "Recommended" (Discover) offers tailored to the user's content and allows to quickly find relevant materials, including articles, programs and applications depending on interests and level of athletic training. In addition, right in the app Samsung Health you can buy sports gadgets, accessories and health products. Improved user interface in the updated Health app Samsung on wearable devices from Samsung provides the user with more information simultaneously, has support for GPS, and allows one click to measure the amount of physical activity and heart rhythm. Users are now offered a choice of 39 different exercises, in addition, they can track their sports achievements by connecting to a wearable device or smart the hours. The most advanced wearable device Samsung Galaxy Watch to track indicators throughout the workout, even if you change the type of load, for example, sits on the stationary bike after my run. Users of "smart" devices Samsung available more features of the updated app Samsung Health. For example, by running the mode "determination of the phase of sleep", they can measure and analyze sleep cycles. In addition, the app allows you to measure heart rate and its changes, and offers step-by-step program of respiratory gymnastics.